Administrative Protections are ways to maintain and preserve wilderness and other conservation-worthy public lands by working with agencies like the U.S. Forest Service (FS), Bureau of Land Management (BLM), National Park Service (NPS) and U.S. Fish and Wildlife Service National Wildlife Refuges (NWR). When these agencies make significant decisions regarding land management, the agencies typically must include citizen input. In fact, laws like the National Environmental Policy Act (NEPA) and regulations governing agency planning often prescribe specific citizen comment periods. Through Administrative Protections, especially through major planning efforts like Land and Resource Management Plans (Forest Plan) for the Forest Service or Resource Management Plans (RMP) for BLM, wilderness-worthy areas can be managed to preserve their wild character. While Administrative Protections don’t offer permanent protection in the way legislation does, Administrative Protections often endure for ten, twenty or more years, and can provide extremely valuable preservation for vulnerable landscapes. The Tonto National Forest (TNF) completed their important criteria for Wilderness Inventory and Wilderness Evaluation as part of their far-reaching Land and Resource Management Plan revision. The TNF encompasses almost 3 million acres, including seven wilderness areas and two wild and scenic rivers. 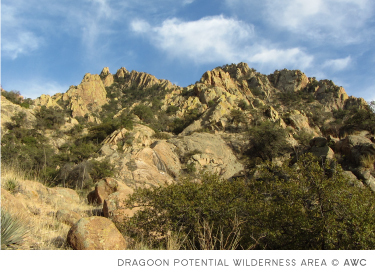 Ranging from Sonoran desert to fir-studded ridgelines, the TNF provides critically important wildlife habitat and popular backcountry recreation just east of the burgeoning Phoenix metro area. You can learn more about the TNF Plan Revision process here. The “Needs to Change” and “Final Assessment” documents have been released. Find them here. RECENT SUCCESS: The TNF included a number of AWC's recommendations in their current draft of Wilderness Criteria – recommendations that should help to keep the process open to consideration of additional wilderness management areas. Read AWC's comments here. Read TNF's current Wilderness Inventory and Wilderness Evaluation draft criteria. NEXT: Stay tuned for upcoming meetings regarding wilderness recommendations. These will be important opportunities to voice the need to conserve more wild places on the TNF. For river lovers – and aren’t we all? – TNF has shared a Wild and Scenic River Story Map with feedback on river classifications. 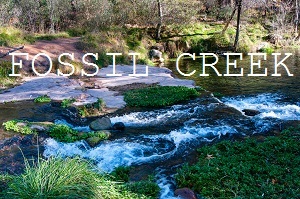 Fossil Creek is a beautiful and unique river that received Wild and Scenic River status in 2009. A proposed management plan recommends increasing motorized access, which generates many concerns about protecting the values for which the river was designated. Increasing visitor demand (which could potentially reach 1700 people a day), and damage in the form of human trash and sewage, threatens the balance of preserving Wild and Scenic qualities at Fossil Creek now and in the future. The Forest Service is addressing this issue with several proposed alternatives to regulate and further develop recreation at Fossil Creek. The last comment deadline was January 27, 2017. Keep in touch for future opportunties to take action. Learn more here. The Bureau of Land Management released its Proposed Resource Management Plan Amendment regarding how recreational target shooting should be managed in the Monument. This National Monument harbors extensive archeological and ecological resources that deserve protection. Inadequately managed target shooting has threatened key values that the Monument was established to conserve. Comments may be submitted until March 15, 2017. Learn more here. 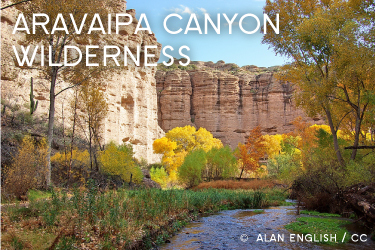 The Bureau of Land Management has finalized the 2015 Aravaipa Canyon Ecosystem (Resource) Management Plan and revised Environmental Assessment.This is one of Arizona’s premier hiking gems, with significant ecological values, so its management plan is especially important. View and download the Aravaipa Canyon Ecosystem Management Plan (be patient, ~9Mb PDF file). The Bureau of Land Management Hassayampa Field Office has completed the Harquahala Mountains Wilderness (Resource) Management Plan and Environmental Assessment (EA). Some citizen comments resulted in changes to the Plan, and you can find a summary of comments and BLM’s responses at the end of the document. The updated 2015 Plan outlines the kinds of activities and amenities that are allowed in and adjacent to the wilderness (which includes parking areas, trails and trailheads, and the use of pack animals). 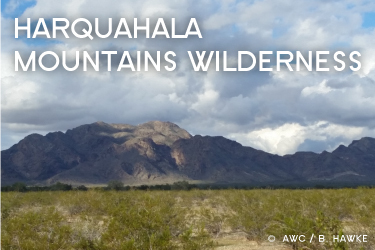 View and download the Harquahala Mountains Wilderness Management Plan (~3Mb). 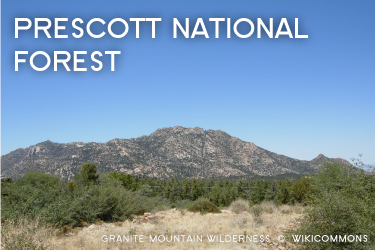 Click here to read AWC’s Appeal, along with other appeals filed, and learn more about the Prescott National Forest 2015 Land & Resources Management Plan. The Bureau of Land Management is currently updating the Resource Management Plan (RMP) for the San Pedro Riparian National Conservation Area (SPRNCA) in southeastern Arizona, which will guide the management of the area for the next 15-20 years. There is a lot at stake for this critically important area, which protects more than 44 miles of the San Pedro River. 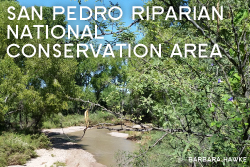 Learn More about the San Pedro Riparian National Conservation Area and the current RMP process. Coconino National Forest Plan Revision page. Coronado National Forest Plan Revision page. 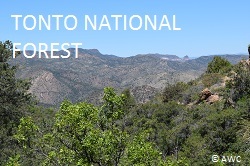 Tonto National Forest Plan Revision page. Citizen Wilderness Inventory formed the foundation of many of the designated wilderness areas that we enjoy today. Using the guidelines of the Wilderness Act of 1964, and additional regulations and policies specific to particular agencies, citizen advocates have surveyed areas to document their roadless conditions and wilderness qualities throughout Arizona. Along with the original Wilderness Act, legislation in 1984 and 1990 resulted in Arizona’s current 90 designated wilderness areas. Today, Citizen Wilderness Inventories may reveal additional areas that qualify for wilderness designation, and just as importantly, inventories identify lands that are appropriate for administrative protection to preserve wilderness characteristics. In 2010 through 2012, the Bureau of Land Management clarified their policies for conducting wilderness inventory, and for considering Lands with Wilderness Characteristics (“LWCs”) in Resource Management Plans. These clarified policies offer opportunities to reassess BLM lands for their wilderness values, and propose management approaches within a spectrum of options to preserve those values. Additionally, the Forest Service adopted a new Planning Rule in 2012. 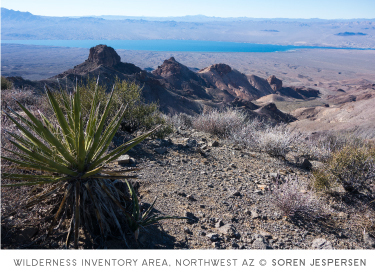 Some public lands in Arizona have not seen wilderness inventory in many years. Since that time, conditions and policies have changed. In an effort to update citizen wilderness inventory in key areas of the state, AWC has begun new citizen wilderness inventory in remote regions of the northwestern and southeastern parts of the state. Other conservation partners are conducting wilderness inventory in additional parts of the state. We look forward to working cooperatively with conservation partners and land management agencies to protect additional lands found to have wilderness characteristics. Intrepid wilderness explorers Joe Trudeau and Amber Fields have documented 671,424 acres of new wilderness-worthy lands in northwestern and southeastern Arizona. In the BLM Kingman Field Office, they identified over 500,000 acres, and in the Safford Field Office, they identified nearly 170,000 acres. We were thrilled to learn that a new jaguar sighting occurred in late 2016 in the Dos Cabezas mountains, an area that includes both designated wilderness, and over 12,000 acres of potential “Lands with Wilderness Characteristics.” Protected wild lands are critical to building a network of habitat and movement corridors for big cats like jaguar and mountain lion, and for many other wildlife species as well. Read more about the experience of our talented wilderness survey team. AWC greatly appreciates the help and support of the Pew Charitable Trusts and staff of The Wilderness Society in conducting citizen wilderness inventory. Donations and monthly giving help us gain the political support necessary to protect our wild places. Donate today!